Conor Maynard has revealed he would love to collaborate with Lily Allen. The 27-year-old Smile star - who recently announced she is working on a new album - is a big fan of the 19-year-old Can't Say No singer. Conor said: "The fact that she's a fan is really cool, so if I ever had the chance to work with her it would be amazing. I don't know what kind of song we'd fit on together but it would definitely be a cool thing. "She came along to one of my first shows in London, unannounced. She didn't even get given a ticket she bought a ticket to come and watch it, it was crazy. " The Vegas Girl star also admitted he gets a bit emotional hearing the crowd sing along to his top three hit Can't Say No, but he loves it. Conor said: "It is a really weird feeling. When I do massive shows like that it's really weird thinking that they're singing a song back to me that I wrote. "Especially as the main part they sing back to me is 'Houston, I think we got a problem' - that was the first line that I put down on the song. "I said 'I really want this song to say Houston I think we got a problem and I really think that that will be a part that everyone will want to sing along to', and sure enough it's the part that everyone does. It makes you want to go and write another song everyone can sing along to." 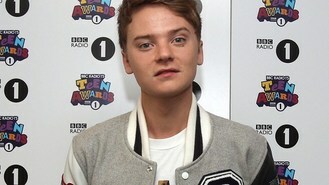 Conor will perform at BBC Radio 1's Teen Awards along with One Direction, Taylor Swift and Little Mix on October 7. Tickets go on sale on September 22 with more details at www.bbc.co.uk/radio1. Rufus Wainwright is reportedly going to jump into the Atlantic to celebrate his wedding this week. Singer Scott McKenzie, best known for the 1967 Summer of Love hit San Francisco (Be Sure to Wear Flowers in Your Hair), has died at the age of 73. Carly Rae Jepsen is rumoured to be dating musician Matthew Koma. One Direction are to headline BBC Radio 1's Teen Awards this year. Jennifer Lopez is set to release a 3D concert movie. Cher Lloyd has thanked her fans for their support after bottles were thrown at her while she was performing at the V Festival. Rizzle Kicks have revealed they're going for a more mature sound on their next album. Geri Halliwell has revealed the "poignant" secret behind her performance with the Spice Girls at the Olympics closing ceremony. Aiden Grimshaw has confessed he is "a bit scared" about the release of his debut album.